Adult contemporary music. There’s not a lot of that out there with soft music beds, dancing rhythms, and powerful vocals. With the power of Bonnie Tyler and the richness of perhaps a balladic Cher, but with a style so all-her-own that neither of those is really a good comparison, Amiena fills a gap in the current musical landscape. I suppose her positioning might be as a big-voice diva in the Adele vein, though it’s not exactly that. Amiena’s music also exhibits the pop sensibilities that helped launch singers like Whitney Houston and Mariah Carey into the public consciousness (for those of us old enough to remember that they launched their careers as danceable pop singers). But that’s enough name-dropping. The comparisons aren’t even that on-point. Amiena’s voice is all her own, as within a couple seconds of hearing one of her songs, I know who’s singing it. Rather, the comparisons are meant to give you an idea of whose musical sandbox she plays in. There’s a bit of syncopated rhythm and maybe a touch of Latin spice in the jangly music bed behind Amiena’s soft, expressive vocal on disc-opener “Chance.” The song allows her to turn her voice over, from soft and sweet to firm and all-business. There’s really no other way to explain the vocal dichotomy that helps make this song so interesting and memorable; stylistically, as well, the vocals progress steadily while the music, in this case, dances around the voice. The next track, “Ghost” (featuring guitarist Nitin Sawhney), has a bit of Americana jangle, largely due to Roly Platt’s guest harmonica part, resulting in a bit of a Richard Marx “Hazard”-ish vibe, but with Amiena’s flowing version of an emotional vocal line. 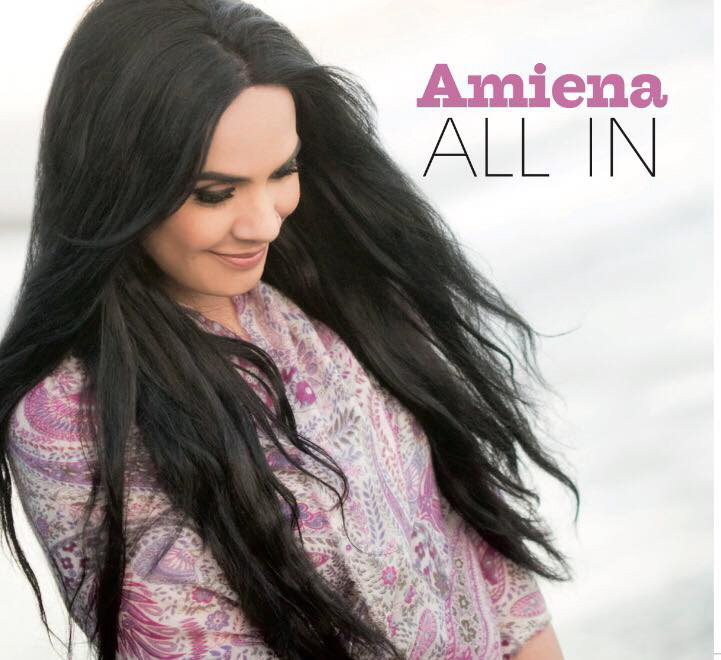 It’s followed by a true, flowing, rising-and-falling ballad, “All In.” The title track’s production delivers a cavernous concert hall flavor to this classic-feeling vocal powerhouse-type song, a rich wall of sound surrounding Amiena’s crisp, strong vocal, all while sporting minimal instrumentation, mostly a keys-and-vocals number. “Come With Me” adds some slow mid-tempo rhythm to the formula, feeling a bit like an ’80s diva almost-dance song – the sort that’s easy to sway energetically to, featuring powerful vocal embellishments, though not exactly what you’d call a dance number. If that description rings true to you, then you’ll know it’s a fun musical lane, very radio-friendly. The rest of the disc falls within the range of its first few songs. I enjoy the stylized vocals and interesting rhythm of “Daydream.” “Frozen” has an interesting rhythmic beat, with the vocals interweaving with the playful percussion. And “Goodbye” weaves intriguing lyrics into the rhythmic pop diva formula, resulting in one of my personal favorite tracks on All In. The last four songs on All In, in their own distinctive ways, utilize the wide-open-spaces flavor that showcases the soft power of Amiena’s vocals in a fashion loosely similar to “All In.” Among the quartet, “Broken” and “My God” are probably my favorites, though only slightly, as “Human” and “Take My Life” have their own unique elements. I’m sure you’ll select your own favorites. But back to this release. Amiena’s voice ranks among the best of her subgenre, with power, emotion, edge, and a memorable tone. And that’s saying something, since her subgenre is powerhouse pop-AC vocalists. I’m so pleased to have been introduced to her music; you really need to listen for yourselves. I don’t currently see any dates listed on Amiena’s calendar, but keep an eye on the “Tour Dates” page of her website or the “Events” tab of her Facebook page for announcements. This entry was posted in Album Reviews and tagged Album Review, Amiena, Geoff Wilbur. Bookmark the permalink. Geoff- very nicely written and evocative.